To say that Oceanhorn: Monster of Uncharted Seas ($7.99) is like The Legend of Zelda, particularly the seafaring The Wind Waker game, is an understatement. Developer Cornfox & Bros. is unapologetic in its attempt to emulate the successful Nintendo action-adventure series. This is Zelda through and through, but it’s not as good. Pretty damn close, though. Where Oceanhorn’s identity shines through is the story. 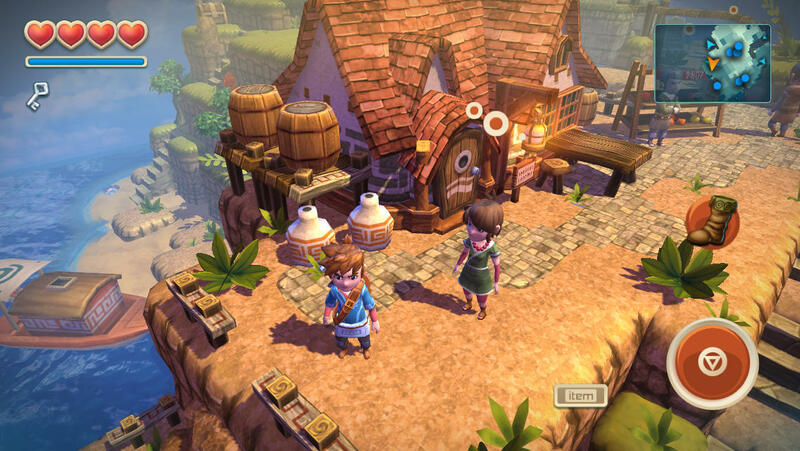 A young boy (brown-haired, not blonde) clad with sword and shield leaves the safety of a small island in search of his father, who’s gone missing — hunting or hunted by the Oceanhorn, a living fortress and terrible mechanical beast. Dark energy has corrupted it and cursed the many islands. To restore the kingdom of Arcadia, the boy needs to collect the sacred emblems of Earth, Ocean, and Sol and defeat the creature with the power of the gods and a legendary sword and shield, all of which you can find in about 10-15 hours. I finished the game at nearly 13 hours and 73 percent completion, with a little of that time spent on side quests. Now, all of this probably sounds unoriginal, and it is. With only minor variations, Oceanhorn shamelessly borrows from the Zelda series, copying enemy designs, the ocean sailing from The Wind Waker, dungeon layouts, and characters like a certain water princess. But the boy’s quest to find his father and learn more about his lost mother is more heartfelt than saving a helpless maiden, and the themes of magic versus technology manifest in a way much more akin to something like Final Fantasy. Oceanhorn might look, play, and feel like Zelda, but it’s got vibes from some great role-playing games. The beautiful score from composers Nobuo Uematsu and Kenji Ito are the reason for that. They help Oceanhorn sound top-notch, and the main theme reminds me a lot of Final Fantasy X (no wonder, since Uematsu worked on it). The excellent music, occasional voice-acting, and vibrant, lush 3D graphics go a long way to make this feel like a quality release. The performance holds. I only noticed very small and infrequent framerate issues on my iPad Mini. Otherwise, this plays like something straight from a handheld like the 3DS. You’re going to get your money’s worth, especially if you have a newer device than mine. 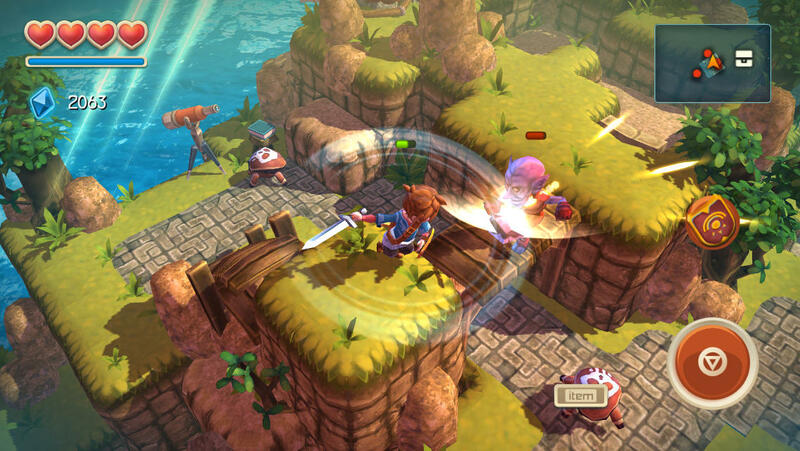 Oceanhorn shines on the iPad Air and iPhone 5, but plays acceptably on every supported device. And Oceanhorn is fun. Yes, you go around exploring islands, looting treasure chests, fighting enemies, and conquering dungeons just like in Zelda. It’s not innovative. But this is probably as close to a true Zelda game as we’re going to get on a mobile device. Some things are unique, and they’re the most rewarding: Unlike in Zelda, killing enemies earns you experience in the way of blue diamonds, which raise your Adventurer level and net you cool bonuses (such as inventory expansions and better stamina) every time you reach a new tier. The touch controls work incredibly well. They’re fluid and natural, and you can choose from a couple different methods, including a virtual analog stick (I liked this best). The interface is clean and easy to use even when under duress. 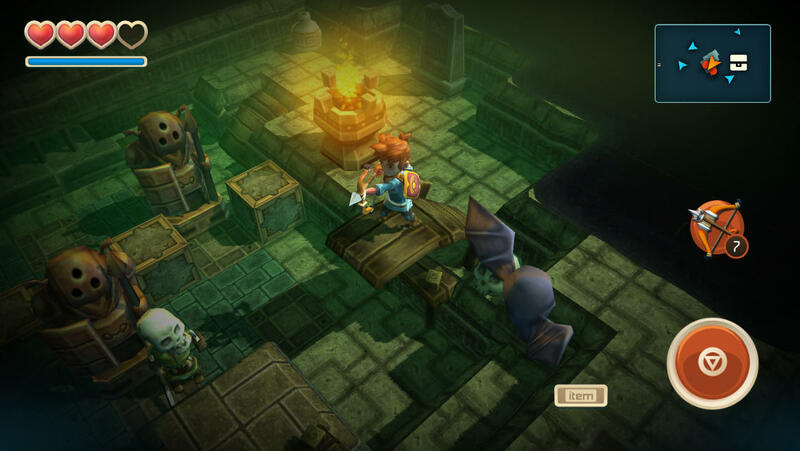 (Note: Oceanhorn does support iOS 7 controllers). Then there is the way you discover locations — one of my favorite parts. It’s cool to probe characters in conversation and get them to mention new islands, which you then chart on your sea map. And for most places, your arrival prompts an audio passage from your father’s notebook. You follow in his footsteps and learn about his adventure as you continue yours. You can also pick up way more than pots (stone blocks, rocks, barrels, lanterns, travel beds, you name it), which is fun in a really silly way, and then hurl them at enemies for extra damage or break them for items. You’ll acquire a lot of the same power-ups that are in Zelda (bombs, a bow and arrows, jumping/dashing boots, etc.) as well as some magic spells. Bosses (I won’t spoil them) are creative and enjoyable and can be challenging until you figure out their weakness. They’re not overtough. Certain enemies might irritate you more. While most foes — Octorok and ChuChu type creatures, for example — are easy enough fodder, some consistently gave me a hard time, like the goblins and undead skeletons. No matter what strategy I tried, they could always get in a hit, and using my shield only allowed them to close the distance and corner me. The worst part, though, is that enemies respawn — incessantly — even when you remain in the same general area. At least destroying monsters earns you plenty of experience. Sailing is rather boring and uneventful until you get a couple upgrades, but that’s about all you get. Likewise, most of the puzzles either involve block-pushing or timers, so they’re not terribly exciting, although I found that they got more inventive once I learned a few magic spells. Collecting red crystals called bloodstones by wailing on them with your sword until their reverberation grows faster and high-pitched is surprisingly satisfying, but I never received a reward for the dozens I collected. I’m not sure, but it may be necessary to locate them all and then claim a single reward rather than smaller prizes along the way, which is disappointing to me, at least. Prepare for two truly pointless and annoying fetch quests, too. I got stuck on the second for at least an hour. It’s a clumsy element from Zelda that definitely doesn’t need mimicked. My last gripe is about the controls. As impressive as they are, the developer doesn’t do enough to explain how they work — even though the islands are littered with helpful signposts. The bow and arrow is hard to aim, and it took me forever to figure out how to properly throw a pot. That’s just stupid. Do I need to swipe with two fingers? One? That seemed to work, but only when I drew directly out from my character. The answer is much simpler: just move in the direction in you want and press the virtual action button (which you use to pick up the object). Yes, that oversight is partly mine, but a little more guidance would have been appreciated. Oceanhorn might be a flawed, blatant rip-off of Zelda, but it’s worth playing — especially for the originality it does introduce. And it might not deliver finely tuned mechanics quite the way Zelda does, but it’s still fun for all the same reasons. Clone or not, we need more high-quality, distraction-free experiences on mobile. 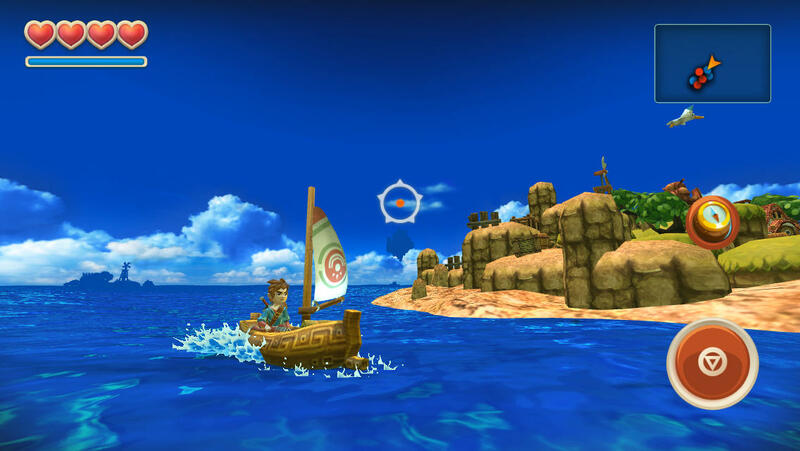 No ads, no IAP, and even with a few blemishes Oceanhorn is a must-have for any iOS gamer.